Our Asian prior art searches are performed by professional who speak local native languages. We don't believe it is possible to perform a thorough Japanese patent search using English abstract or machine translation, although some search firms in the US and Europe do that. We are one of the marjor search firms serving North America and Europe clients to search Japanese using local language with deliverables in English. Please refer to some examples. Please also refer to Japanese Patent Database we use. 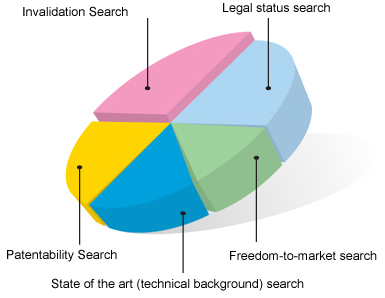 How to search Japanese patents (PDF). We search Asian patents using local languages and send you a report and other supporting documents in English by fully utilizing a combination of our knowledge and expertise in search skills, technical expertise, patent practice, and linguistic skills. Whether you need a thorough patent search for either offensive or defensive infringement litigation, or you need information to decide the novelty/validity of an invention, or freedom-to-operate opinion, we can help. Depending on your needs, our Japanese translator can also translate the Japanese prior art into English for your convenience. We also perform Chinese and Korean patent search and translation services.